NW Foodie Blogger and Reviewer! I love my kitchen. Granted I could do with it being a bit bigger, ok well A LOT bigger, like BuckinghamPalace size bigger, but it’s my kitchen and at the moment, it works well enough for me. I have most mod cons, a dishwasher that was handed down to us and other appliances that have been treated with kid gloves to make sure they last us as long as possible and I have other gadgets and gizmo’s that I haven’t even used yet. A food processor that was given to us as a wedding gift is sat in its box in my father’s garage because we simply have NO ROOM, hence needing a bigger kitchen. I also have a steamer and rice cooker, again they are wedding presents (we’ve been married 8 years folks) that are still sat pristine in their boxes hidden away until the time of their unveiling! We have a number of serving dishes, some mismatched crockery, flasks, other bits and bobs, pots and pans and a gazillion mugs. I can’t wait for the time when I can sort these things out and regain some peace in the chaos that lurks behind my cupboard doors. 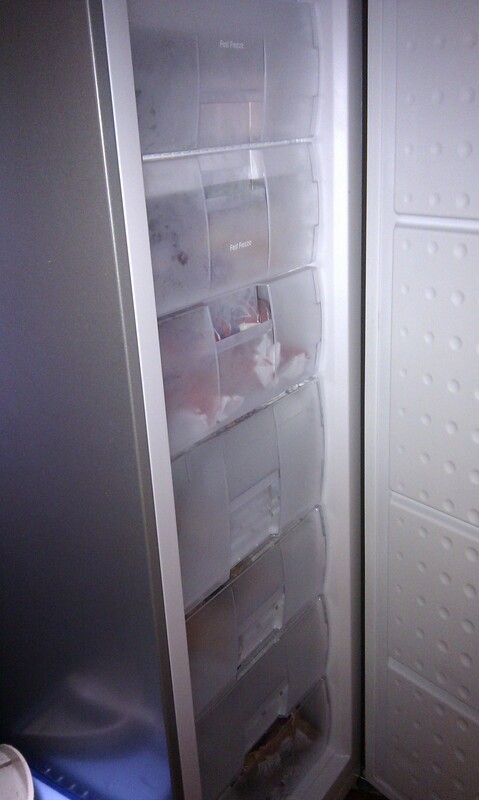 I’m sorry to report that recently, we lost our fridge-freezer to the big fridge-freezer yard in the sky. The freezer part was so broken and mangled that everything in the fridge would just freeze up and we ended up with a lot of waste that just broke my heart. After scouring the internet to check out prices, brands, sizes and then going on a ‘reccy’ mission inWhiteCity,Manchester, we settled on buying two separate appliances. I didn’t want the same thing to happen again and feel quite happy that if something goes wrong with one of them, then that is the is the only one we have to replace. Because I didn’t have a working freezer for such a long time, I have to admit now that our freezer is absolutely my most favourite appliance. It holds an incredible amount of food that I batch cook amongst the usual suspects like ice cream, fish fingers, some vegetables and pizza!!! It sits in the utility room which reaches temperatures of -15ºC in the dead of winter but being a BEKO, it can withstand fluctuations of outside temperature from that extreme to much higher ones. I absolutely cannot do without my freezer and want to know what YOUR favourite appliance is and why you can’t do without it! Feel free to comment below with your recommendations! !